Trim the edges again, slice and serve! 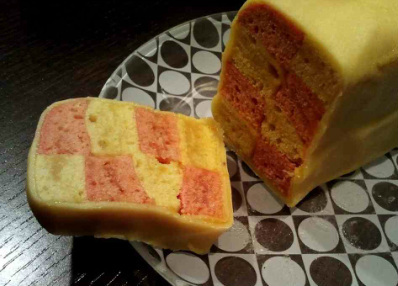 This picture is of a slightly more experimental approach to pattern making resulting in a 'double decker' cake! Use your own jam if you can; I amended the Apple Spread recipe to use apricots instead. Warning - do not store this in the 'fridge once it has it's little marzipan jacket on. Marzipan does not like being in the 'fridge and goes runny!